I will be sharing something I love — the written word — at a book event in Taos on Saturday, March 25. Specifically, I will be reading from my recently released novel, The Sweet Spot. The reading and signing will be held 2 p.m. at Op. Cit. Books in the John Dunn Shops in downtown Taos. For those who don’t regularly follow my posts on this website, The Sweet Spot is the first of my hilltown novels to be published. Here’s the two-sentence synopsis: Most in Conwell love Edie St. Claire, the widow of a soldier killed in Vietnam, until her affair with his married brother ends tragically. She tries to survive this small town’s biggest scandal through the help of her rough-sawn family and a badly scarred man who’s arrived for his fresh start. At readings for other novels, I’ve been interviewed by a fellow author and had a friend play music — The Beatles on the bassoon no less. I’ve served brownies sans pot. Once, I had a slideshow of images taken from a middle grade book. This time, I will be strictly chatting and reading aloud. Right now I am deciding the passages I want to share Saturday. I want people to get to know Edie St. Claire, the novel’s main character, so I might start with the opening scene. There are two more crucial characters in The Sweet Spot. One is Edie’s married brother-in-law Walker St. Claire. Their affair ends horribly for both of them. Then there is Harlan Doyle, the scarred stranger who moves next door for his fresh start. 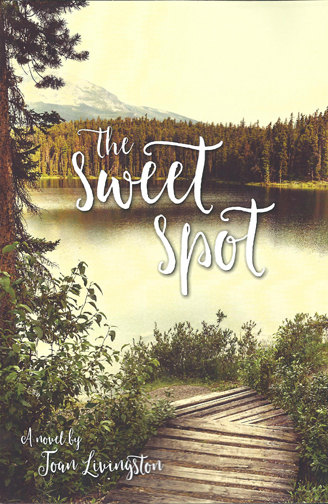 The Sweet Spot has two fun characters: Edie’s father, who is a delightful old coot, and Leona, her no-holds-barred aunt. They offer a humorous counterpoint to the novel’s tragic elements. Plus, they are wonderfully rough-sawn in a hilltown kind of way. I must find a way to share them with listeners. I am fond of one scene I find hilarious — when Edie’s softball team debates what constitutes a good man. Would listeners be lost because it has so many characters? I will have to figure that one out. Although there are scenes later in the book I’d love to read aloud, I don’t want to give anything away, so I will stick with those in the first part. My job for the next few days is to rehearse the selected passages. I want this to be a fun event. For those who live in Taos, I hope you’ll join me Saturday. Live too far away? Please be there in spirit. I could use your support.